Becoming a mum for the first-time is the best thing I have ever done. It is better than all of the other things I have worked for in life, such as my degree, my post-grad and my career as a Teacher. There are so many things to love about being a mum; it is filled with warmth and magic. 1) Feeling Proud - having a baby is a major achievement and a real turning point in your life, so naturally you swell with pride whenever your baby does something new or 'clever', or when people say nice, complimentary things about them. 2) Seeing their Successes - I love seeing Jake achieve something! Just recently he has discovered how to grab and pull things towards him, or pull them away from his face. I love watching him work this out and manage it. Soooo cute! 3) Watching them grow - Over the last 16 weeks I have seen Jake grow from this little, tiny newborn into a cheeky chappy! He's full of personality and I think he's adorable. Whilst he's still the same Jake, you can see just how much he's grown and changed already. It's such a privilege to watch him grow. 4) Interacting with them - my favourite part of any day is when Jake smiles at me. I love seeing him smile, laugh, or get all excited and kick his legs. These little interactions say an awful lot, and they squeeze your heart so tight that it takes your breath away. There's nothing else in the world that can give you *that* high. 5) Watching Daddy - there's something heart-melting about watching the man you love, love your baby and make your baby happy. When Daddy cuddles and plays with Jake it's like one of those Netflix shows you can't stop bingeing on! Addictively adorable. 6) Shopping - I totally love to buy things for Jake. In fact, since becoming a mum I have hardly spent any money on myself. It's not just about cute clothes and toys, I have also tried to spend money in things that can be kept, and remembered, such as photographs, albums and keepsakes. 7) Taking Time - Luke and I were together for 12 years before we married in the summer of 2013. It became easy to breeze through things without taking the time to 'stop and smell the roses'. Already, since becoming parents, important dates such as family birthdays and events such as Christmas have become more central and we've taken the time to mark these moments and make them memorable. 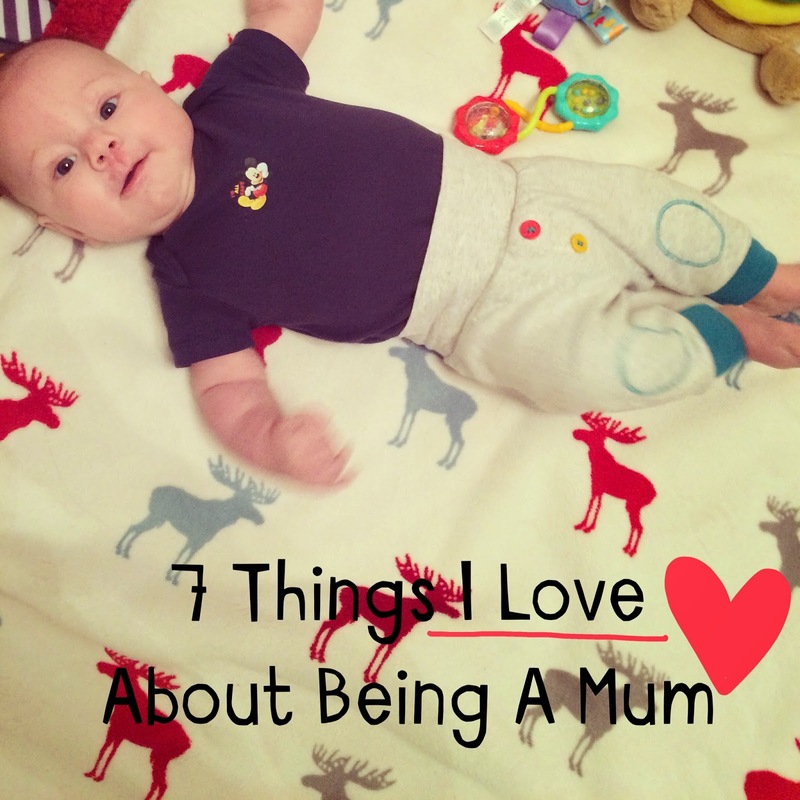 There are soooo many other things I love about becoming a mum! What do you love? Is it different for dads? I am definitely proud of myself. I would have never imagined to be able to raise a child, never even mind to be able to get pregnant and deliver the baby. Big achievement I think. And I am going to do it all over again. Must be mad. :) It is an amazing feeling though. Aw yes when you have more than one that must be lovely!